Sometime soon we’ll be heading down to the Silver Ball Museum in Asbury Park, N.J., which I just learned has an incredible collection of vintage pinball machines — including Jungle King (! ), which devoured untold numbers of my precious quarters and God knows how many hours I should have spent studying at the small university I attended in western New York state. Best of all, the museum isn’t really a museum! It’s open to the public. 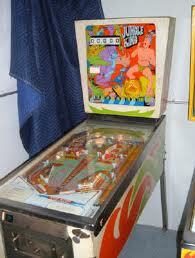 For an all-day admission fee of $20, pinball wizards such as myself get to play all day on machines, including the circa-1973 Jungle King! During the somewhat hazy years I spent barely toiling in the fields of academe, my kingdom was the world of Jungle King. And I was the king of Jungle King. 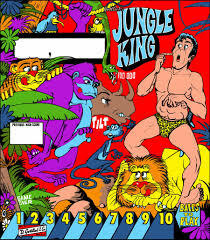 Yes, indeed, the skills and thrills of Jungle King revolved around learning the tricks and moves necessary to win extra balls and extra games. I became remarkably adept, after investing many quarters in my Jungle King education and field training, at “catching” the silver balls with the flippers, waiting for the rollovers and targets to light up, and then unleashing a machine-gun-like barrage of pinballs at the free-ball and bonus score targets. I got to the point where I could make one quarter and one game last for hours. Literally. Free ball after ball. Free game after free game. Setting the “New High Score” and then shattering my own world record (or at least the high-score record for the machine in the college student center). It is beyond dispute that I was the true king of Jungle King. I hereby decree and proclaim to my faithful subjects that sometime in the next few weeks I shall be traveling with the royal entourage to the Shores of Jersey to reclaim my pinball crown and, yes, to take back my rightful kingdom. Pretenders to the crown, you have been warned.